(Central Islip, N.Y., Feb. 13, 2018) – The Long Island Ducks today announced the signing of first baseman David Washington. The former big leaguer will begin his first season with the Ducks and 10th in professional baseball. 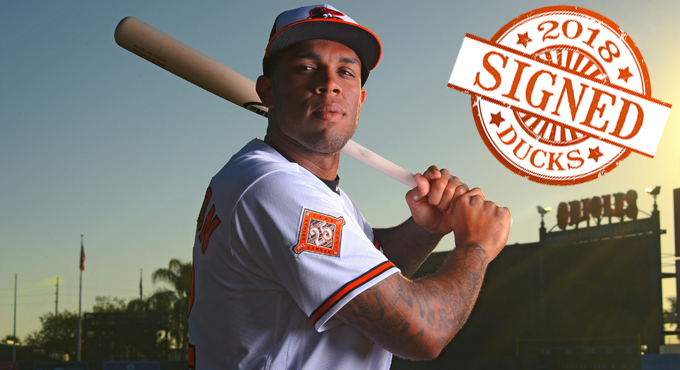 Washington earned his first MLB promotion in 2017 when the Baltimore Orioles selected his contract on June 14. He served as the designated hitter in his first big league game, a 10-6 win over the Chicago White Sox at Guaranteed Rate Field. The San Diego native spent the majority of the season with Triple-A Norfolk, compiling a .264 batting average with 18 home runs, 42 RBI, 49 runs scored and 23 doubles in 102 games. Defensively, he posted a .988 fielding percentage in 71 games at first base and did not commit a single error over 26 games played in the outfield. The 27-year-old put together a career-year in 2016. He combined to play a career-high 127 games between Double-A Springfield and Triple-A Memphis in the St. Louis Cardinals organization, accruing career-best totals in home runs (30), RBI (77), runs (67), hits (109) and walks (67). For his efforts, he was named an MiLB.com Organization All-Star with St. Louis. The University City High School alum was selected as a New York-Penn League Mid-Season All-Star in 2013, batting .261 with 10 homers, 50 RBI, 34 runs and 17 doubles in 72 games with the State College Spikes. Entering 2018, Washington has totaled 110 home runs, 358 RBI, 319 runs, 600 hits and 141 doubles over 687 games. He was originally drafted by the Cardinals in the 15th round of the 2009 amateur draft.